WINNER: 2011 Outstanding Book Award from the American Society of Journalists and Authors. When does a green home project make financial sense? The authors of this book provide the answer to this and other questions relating to the cost (and relative value) of environmentally friendly home improvements. Eric Corey Freed and Kevin Daum are experts, respectively, in green building and in financing custom homes. 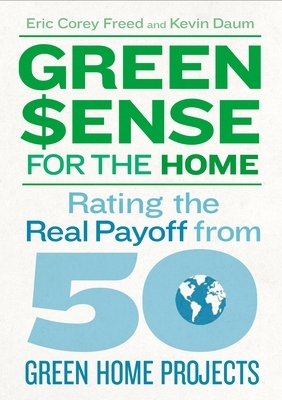 In this information-packed book, they walk readers through 50 green home projects and break them down according to the positive impact they have on the environment, as well as the impact they may have (both positive and negative) on the reader's wallet. They evaluate a wide array of projects, including insulating pipes, weatherizing doors and windows, composting and recycling trash, installing a solar hot water heater, installing green countertops, upgrading appliances, building with reclaimed materials, and installing radiant heat. This unique perspective on going green is a reference that green-leaning homeowners simply cannot do without. Eric Corey Freed is principal of organicARCHITECT, an architecture and consulting firm in San Francisco, with 15 years of experience in green building. He writes a syndicated column at GreenerBuildings.com and lectures on the subject at more than 40 conferences a year. He is the author of "Green Building"" & Remodeling for Dummies." An expert on financing custom homes, Kevin Daum is the author of "Building Your Own Home for Dummies," named the #1 custom home resource guide by the "Wall Street Journal."